What do Julius Erving, Larry Brown, Moses Malone, Bob Costas, the Indiana Pacers, the San Antonio Spurs and the Slam Dunk Contest have in common? They all got their professional starts in the American Basketball Association. The NBA may have won the financial battle, but the ABA won the artistic war. With its stress on wide-open individual play, the adoption of the 3-point shot and pressing defense, and the encouragement of flashy moves and flying dunks, today's NBA is still -- decades later -- just the ABA without the red, white and blue ball. 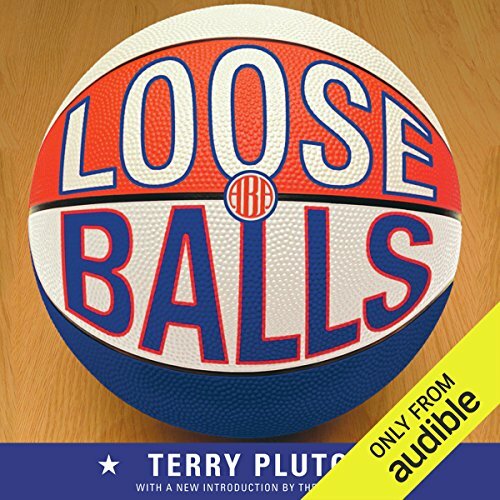 ©1990 Terry Pluto (P)2013 Audible, Inc. I grew up in North Carolina in the early seventies and I was occasionally able to watch the Carolina Cougars. The ABA was a freewheeling league, where a lot of weird things happened; and the game appeared to be a lotta fun; both for the fans and the players. I watched the game where George McGinnis set a new rebounding record by banging the ball of the rim and backboard a few times. I can still remember the voice of the Cougars; Bob Laney of WSOC-AM doing the play-by-play as I lay in my bunk bed at night. Now for the negatives. I'm not sure which reader it was who was constantly mangling every name more complicated than Smith or Jones, but he was extremely difficult to listen to. It was disconcerting and affected my enjoyment of the format. It could have done without so many redundant comments as well. It might have been a better listen if it had been a few hours shorter. So if you're a hard-core fan of the ABA; or a fan of old school hoops from the seventies; this might be a good listen. For anyone else; I have a hard time recommending it. You know that you have a basketball heart when you spend the better part of two days listening to this book. I know that some of the inside stories are just a crock; The story about how the Dr. got his nickname has been proven incorrect buy the Doctor himself. So when you know that piece of information it does reduce the credibility of the rest of the "insider" story. However, if you love basketball and lived a few of these stories yourself then sitting down for an afternoon with this Audible book is not such a bad way to spend the afternoon. A fine oral history with just one GIANT caveat. Mispronounced names are never ending. Through the entire book. The fact the pronunciations even change for the same name during the same chapters. From chapter one thru the conclusion it is non stop. A really great format with Really great stories makes it a really great and enjoyable book. Great Story funny & Very informative! Growing up in NC, my Dad took me to see the Carolina Cougars in Greensboro, NC. I really loved the Cougars and especially that Red-White-Blue basketball! This book brought back a lot of great memories and was very informative.